What is a piezoelectric force sensor? What is the vibration amplitude to be monitored? What is the frequency range to be monitored? What is the temperature range of the installation? What is the size and shape of the sample to be monitored? Is there a high level of electrical noise in the area? Is the surface where the accelerometer is to be mounted grounded? Does the area require Intrinsically safe or explosion proof instruments? Is the area a wet or a wash down area? 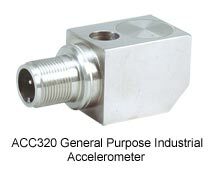 A portable acceleration Data Logger is ideal for assessing the health and diagnosing performance problems of rotating machinery to reveal whether a motor is running efficiently and even indicate whether it may fail in the future.